those hollows were dry 45 minutes previously……………….. 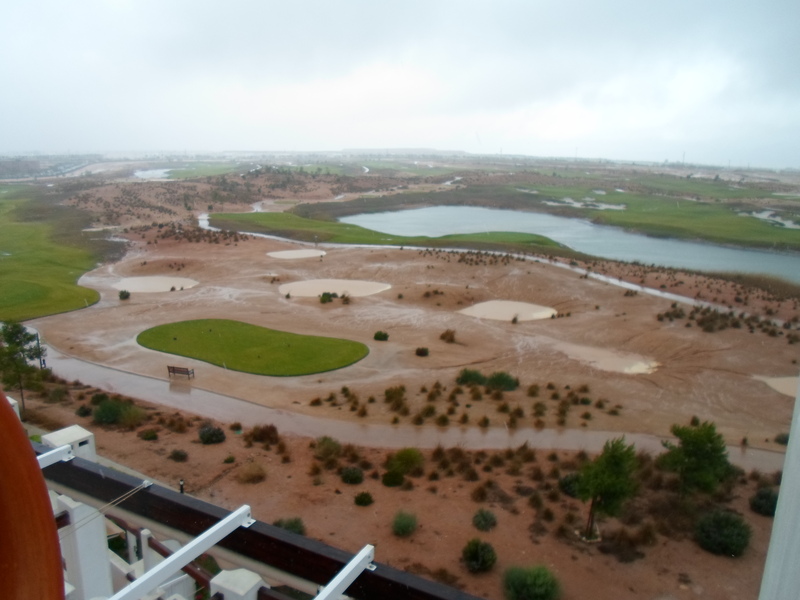 The orange alert forecast for rain in Murcia frightened off most of the players – out of 45 entries only 17 went out. We did have some rain overnight but at 08.30 it was not raining. The skies looked very threatening and the forecast for the day was very bad. Within an hour, the wind was bending the flags on the practice area, but still no rain. The competitions committee had to make an early decision on the competition and decided to cancel the event. At 11.45 it started to rain – within 45 minutes everywhere was flooded. I ran 10 yds from Condado Club across the road to the car and was soaked! Very reminiscent of the 4 hour deluge which devastated the course 2 years ago. Those brave starters left the course half way round. The first rain of the summer managed to disable the electrics in the clubhouse, so no coffee for the golf absentees. The promised buggies actually arrived yesterday, so there won’t be a problem for the big competitions next month. The course will not be closed now on October 24/25/26th. The professional tour event has been postponed until later in the year. Many of the possible entrants are still trying to qualify for next years european tour (the challenge tour still has events). This means there will not be a problem for the norwegian visitors who have their own event that week. On that point, the norwegian team have ordered their own shirts to commemorate the event. As a response, could all UK & Ireland players wear their yellow Condado society shirts? 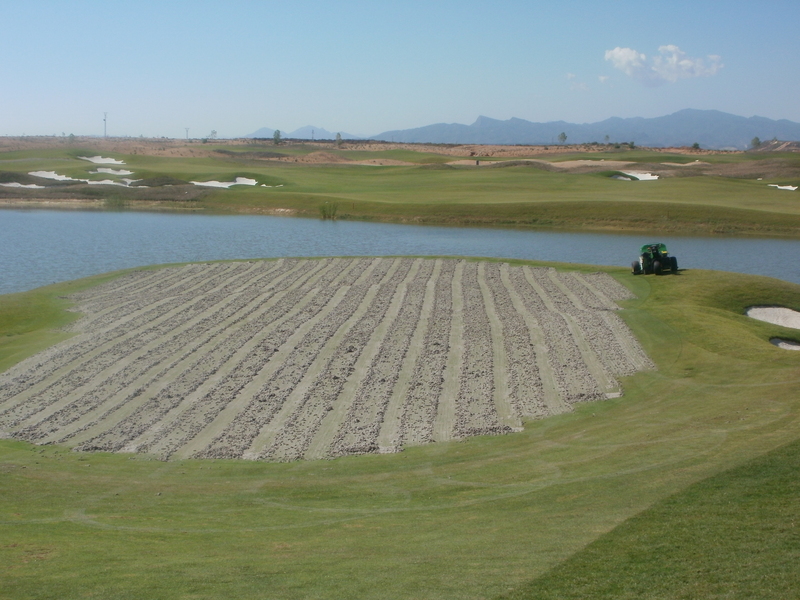 Global Golf and Alhama de Murcia town council intend to play a competition in November to inaugurate the course. It was hoped that Miguel Angel Jiminez (European Ryder Cup vice captain) would attend, but he has other commitments. He says he will visit later and give a free clinic. The management have informed us that they intend to install steps from the practice range to the clubhouse. The professional for Global Golf (Javier Garralon) who is based at Mar Menor has agreed to offer society members a 25% discount on tuition fees. This discount was previously only for hotel guests and residents. For example, an individual 30 minute lesson should be 28 euros but will be 21 euros for us. Next week is a 2 person texas scramble. This week was a pairs strokeplay event, played with cloud cover which made it perfect golfing conditions. We also has a few drops of rain, which threatened the use of brollies, but it died away as soon as it came. 49 players took part (a few dropped out at the last minute). We have just had the hottest and driest weather in Murcia for 70 years. However this is not the reason that we have no water in the lakes on holes 4 and 5. It seems that they have been drained on health and safety grounds to avoid John Pitman drowning! The strokeplay format did make a difference to the prizes – Pat Hughes and Peter Reeves finished in 3rd place 2 shots behind the winners, but their card included a 10 at the 4th! Thers were 5 two’s on the day. Graham White, Liam Higgins, Linda Lloyd and Dave Lloyd (2). They all received one of Neil’s special vodka shots! There was a good crowd at the clubhouse bar after and I am sure Inter Continental hotel group appreciate our custom. We now have tables, chairs and parasols on the roof terrace, and comfortable furniture inside the upstairs lounge. I have been told that a television will be installed in the room, but don’t expect sky sports! Next years diary is now in production and should be delivered early November. We have removed blind pairs comps as it seems unfair that the player with the best score can finish up with nothing! Also there are no 3 person team events as these would cause problems with buggy allocation. We still accept membership applications every wednesday and friday in the Clover (during the roll up, and at the presentation) but it is now possible to pay over the bar and collect your card later. Aguilon golf have been running a qualifying competition to select players to play against Spain in a Ryder Cup style challenge. This has taken place on 3 dates, with the best scores earning a place in the team. I am pleased to report that 3 of our members have made the team. They are Dave Lloyd, Dave Storey and Ged Errington. Good luck to them and hopefully we will have a report on the event. The head greenkeeper has posted a news update on our noticeboard. It introduces to one of the greenkeepers (Manuel) with a photo, and gives an update of the condition of the course and planned maintenance. It is a welcome piece of information and I hope it continues. The only problem is it is in spanish! Maybe we will get a translation next time! The September free members draw was won by number 614. We believe it is one of Dave Smith’s sons, but we have no first name. This needs to be claimed within the next month or the prize will be used again. 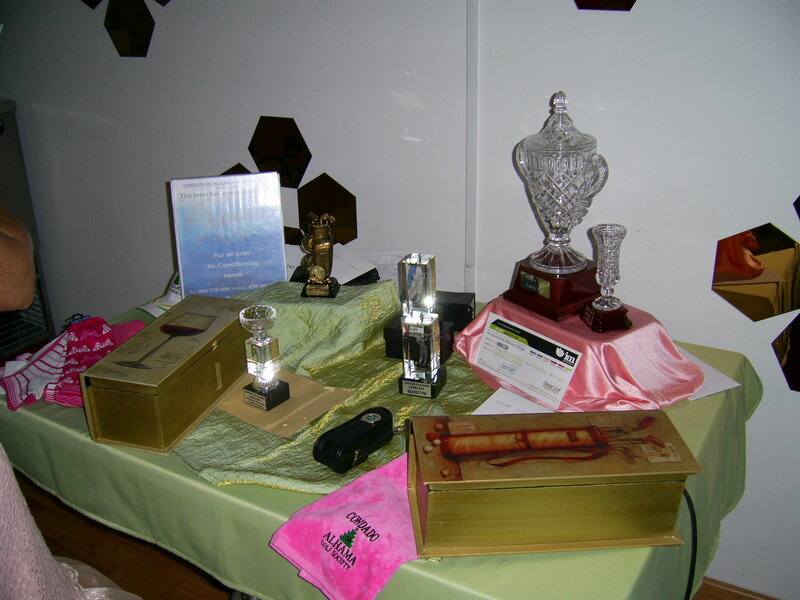 A fine selection of trophies and prizes………………….. The Cath Emmett-Smith Ladies day was an unqualified success, with a record 14 ladies entering the competition. 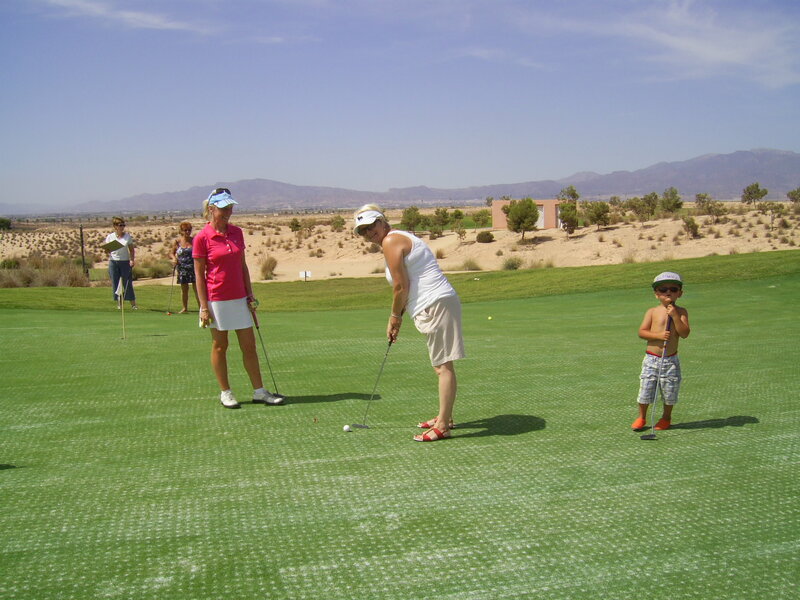 There were also 16 ladies joined the non-golfers competition on the practice putting green, and they enjoyed the day immensely. It was a bit of fun, but it was nice to see the girls enjoy themselves and all get together with the ‘real’ golfers un the terrace afterwards. There was also a great entry for the Apollo Air monthly stableford, which was also open to the Ladies. A total of 56 players took part. 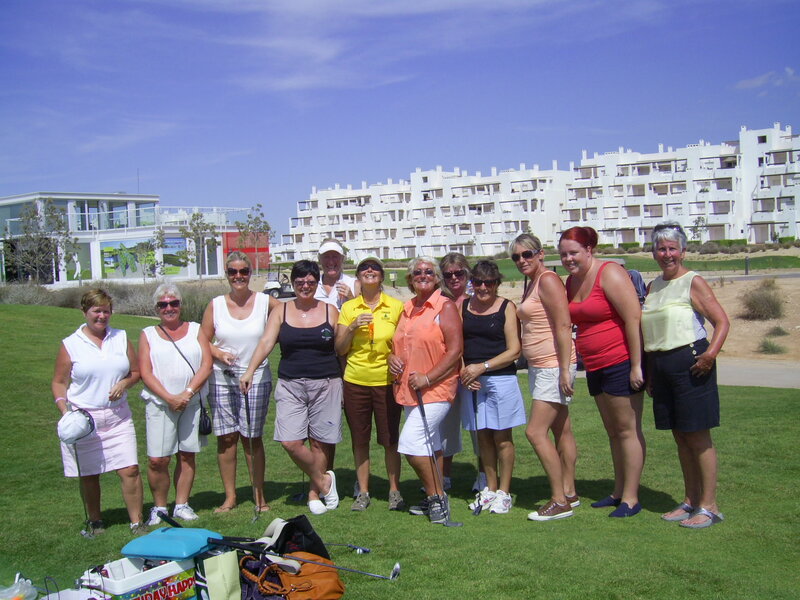 It was great to see all the lady non-golfers join in……………………. Thanks to Kim Lloyd who gave Cath a great deal of help and support on the day. Also thanks to Ray and Brian who controlled the putting competition. Rita tries for a hole in one while Kim looks on…………….. The ladies were put under pressure by the film crew – what next? X Factor? Everyone joined up on the terrace for a post game drink and chat……………..
After the hollow tining of last weekend, the greens were not good, with more sand than grass visible, although they have improved day on day during the week. They should be acceptable within another 7 days. Midweek it was nice to see some water being pumped into the lake at the side of 13, but unfortunately it had been turned off by Friday and is still disappointingly low. The lakes on 4 and 5 also look very sad with no water in them at all. 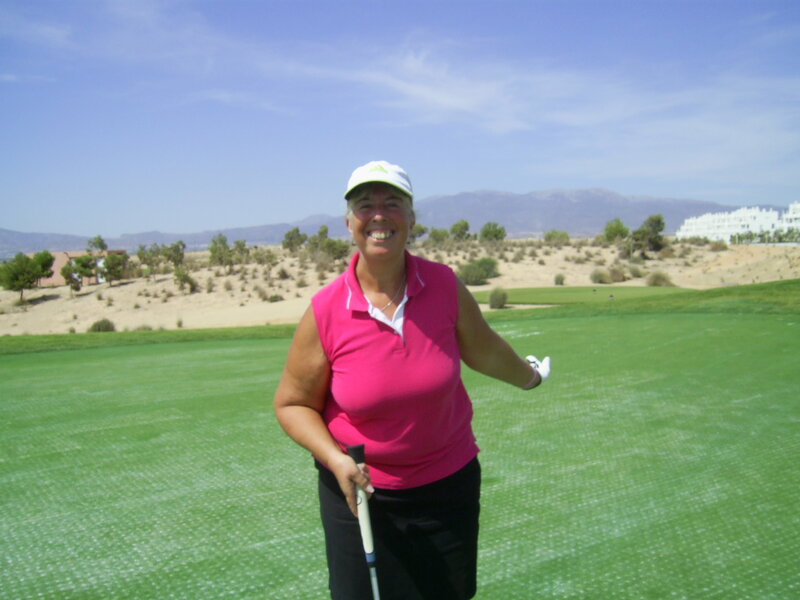 I think Lesley is saying she can’t putt on these greens…………..
‘Slider’ Pitman kept out of the lake this week, but Kim Lloyd did a good impression of him when she finished up on her back in the dried up mud! There were many excellent score on the day, so check the board for the handicap reductions. Players should soon get used to the new procedures with cards – when you have paid your green fee in the shop collect your card from the table in the lobby. When your round is complete, bring the card back to the clubhouse, where Graham will be waiting in air-conditioned luxury with a beer close by! It is no fun sitting by the 18th green in baking heat waiting for the cards to come in. Start sheets for the following Monday, Wednesday and Friday should be posted on the society noticeboard on Fridays following the golf. The weather is still unrelenting, with sunshine greeting us every morning (not that I am complaining). I think it has rained twice since about April, and both times it was during the night and I missed it! Congratulations and well done to all those winners. Thanks to Antonio (head professional for Global Golf) for donating a free lesson to the winner of the non-golfers competition – maybe Marie will take up golf seriously and give hubbie Paul a good thrashing? Following the golf we had 60 players and guests at the Condado Club where we dined and were entertained by the ever popular Beagles (Martin & Stu). The room has been refitted and is now an excellent entertainment venue. 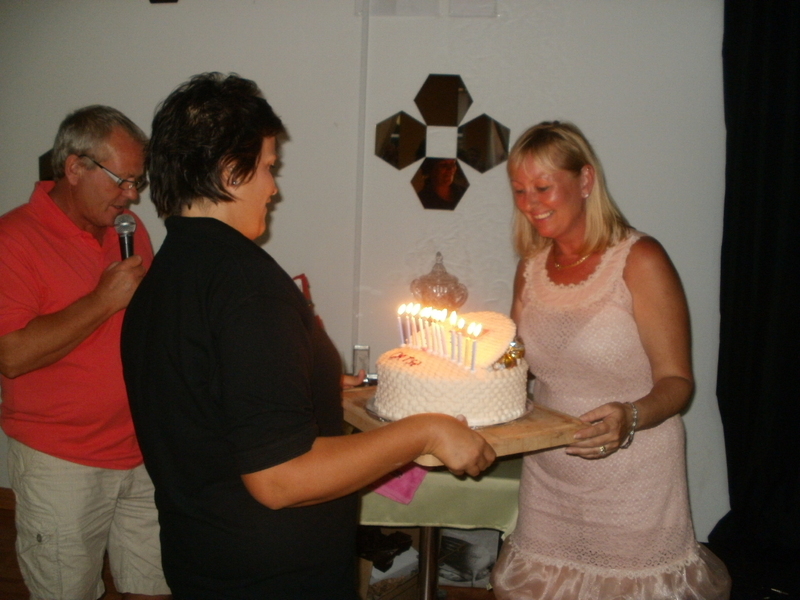 We also celebrated Cath’s birthday (won’t say how old she is but she won’t be in her 40’s again). 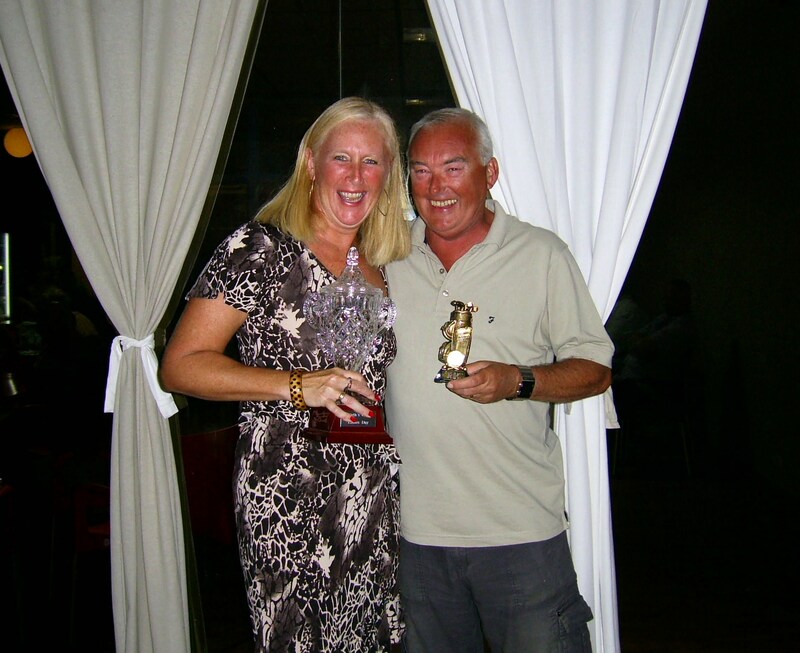 We had Neil close by in his role as a firefighter……………………..
Next week is a pairs strokeplay competition, and as Kevin is back in the UK (under protest! ), and vice captain Paul is also in blighty I shall oversee the presentation. Tuesday is the final qualifier for the Aguilon Ryder Cup competition, with a great deal at only 25 euros. If you have played in one of the previous 2 qualifiers it will be only 15 euros entry – a great deal for an interesting course. No more majors now until next year, but there are 2 special event competitions in October and one in November. On the 23rd it is the annual challenge against the vikings – Norway & Scandinavia against UK & Ireland. This will be a shotgun start with 4 players on each tee for a 9.30am start. From the 24th until the 26th the professional tour are back (formerly Hi5). It looks like the Seniors trophy for players aged 55 and over (scheduled for the 26th) will have to be rearranged. On the 29th it is the society away day at Villataina (Benidorm) which includes a 2 night stay at the superb Corona del Mar hotel near to the old town. It is Graham’s birthday on the 30th so we should have a great party night! On November 2nd Kevin Smith is sponsoring 4 person texas scramble competition (details to follow later). On Wednesday we tried out the new course at Lorca. The offer was 20 euros with a buggy, and the money was well spent. The greens were not as bad as expected, but perhaps the fairways and bunkers could have been better maintained. I don’t think they have anywhere near as many staff as Condado so everything is not done everyday. They were cutting fairways behind us but that didn’t benefit us. The staff in the shop and the bar couid not do enough for us – they were so pleasant and accomodating (thanks Ana). Congratulations Neil for winning with 32 pts. At Lorca everyone from Condado can expect their slope handicap to come down significantly – If you drive well you will clear all the ravines on the front nine – otherwise nil points! Low handicappers will score well. The general impression was that we will go back. It was an interesting course. The par 3’s were good and the scenery was fantastic. Great views from the small but excellent bar. This week our course was closed, with options available to play at any other Global Golf course for the same price. 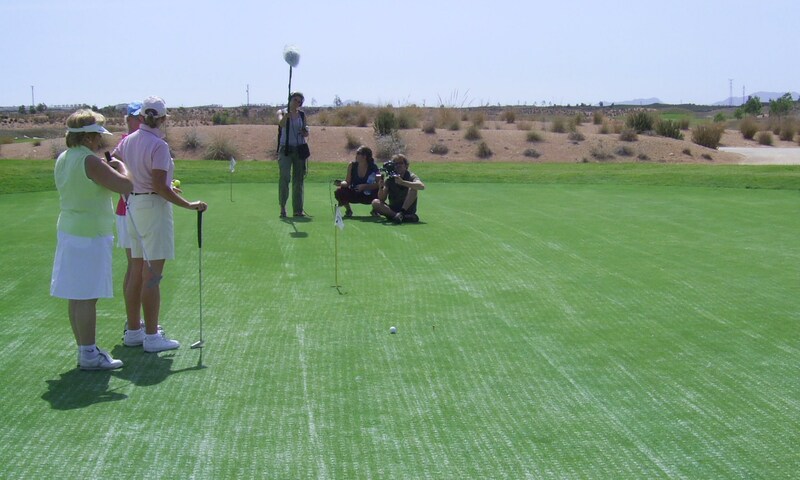 We chose El Valle, which everyone enjoyed, but we didn’t know that they had just completed their maintainance, so the greens were poor (Lorca’s were as good, with a price reduction which we didn’t get at this Golbal Golf Course. Our course reopens on Sunday. We had 28 players in a 1,2,3, waltz and many had not played the course before. 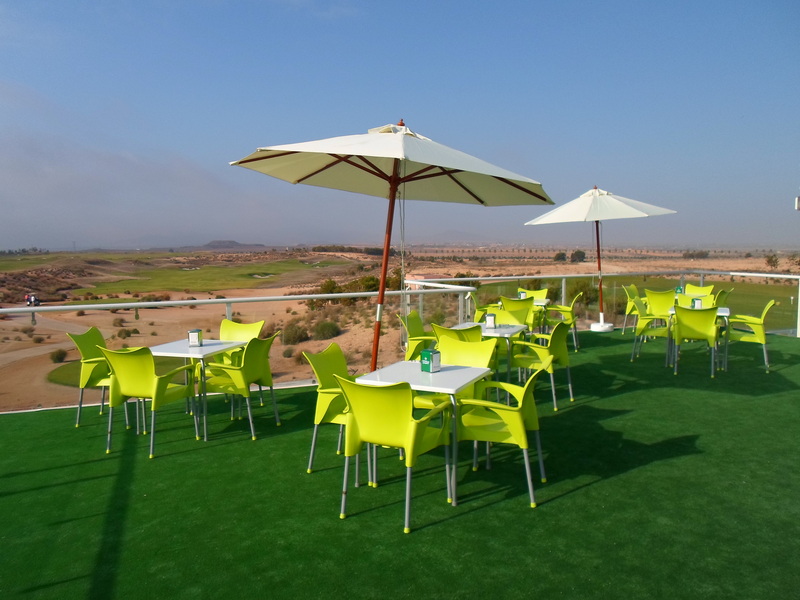 Everyone was impressed with the layout and services – it was wonderful for us all to sit on the terrace with views of the Mar Menor and La Manga strip in the distance with some cold buckets of beer! Just like to point out that the food menu and prices were identical to Condado clubhouse. Don’t think they will get may takers at 12 euros for a chicken salad or a burger. Hopefully they wiil reduce their prices rather than close the clubhouse down. Next week is the Ladies day (lady non-golfers can enter the putting competition which starts at 1pm), and also there will be the Apollo Air monthly trophy for everyone. The evening presentation will be at the Condado Club (meal and entertainment 12 euros) see Cath for tickets. The first 3 times will be reserved for the ladies. Remember if you want to play in the Viking Cup (October 23rd) You need to contact Dave Lloyd (UK & Ireland) or Jan Skjold (Norway and Scandinavia) Jan has only a couple of spaces left for the shotgun start and UK & Ireland have about 10 places (1st entries prioritised). There is an inter-society cup on November 7th with 7 societies already signed up. This should promote the resort with societies coming back. Global Golf will sponsor the day. This week we had 36 players for the individual stableford. The overnight rain which was forecast only lasted 30 minutes, so conditions were good with a cloud cover keeping the heat off. John Pitman provided us with his usual party trick of falling in the lake – only difference was there was no water in it this week and he settled for covering his arms and shirt in dried clay! It was nice to sit under the awnings outside the clubhouse today (Monday) with a beer and fellow golfers. What more do you need? Fantastic views all around. Our course is closed Thursday, Friday and Saturday for hollow tining. So we are going to Lorca Wednesday (20e with buggy) and El Valle Friday (condado prices).